The dead submarine crew hadn't moved from their stations for nearly 150 years when the vessel was raised from the ocean in 2000. Whatever killed them happened so suddenly that they never made a run for the escape hatch. What's more, they had no obvious physical injuries. But in research published Wednesday in the journal Plos One, one group of scientists thinks they've finally cracked the case of what killed the crew so swiftly. It sank the enemy ship with a 135-pound torpedo, which was filled with black powder and attached to a pole 16 feet from the ship's hull. The study authors say the torpedo is the key -- but many have wondered how an explosion could've killed the entire crew without leaving a trace. "Initially, when she was talking about blasting, I was a little concerned," said Pitt, 65, a sixth-generation family farmer, whose grandchildren now make eight generations. "It had a little geyser to it," he said. "It was neat to see." "They were sitting perfectly still in that submarine," Pitt said. "I think people would like to know what did happen to the crew. Everything about the story is intriguing." Suspended inside the CSS Tiny was a small pressure gauge, which revealed how the sub's own torpedo blast could have killed the Hunley crew without leaving a lasting mark: the shock wave created by the blast. 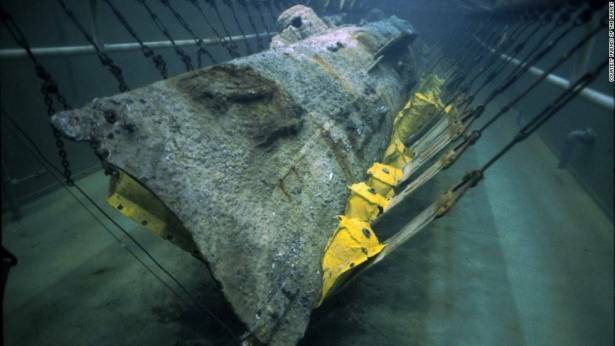 The shock wave hit the Hunley's hull, which was less than an inch thick, said Lance, lead author of the new study. The metal bent ever so slightly but fast enough to transfer the blast wave to the inside of the cabin. "The issue is when it's passing through (the tissues) and it suddenly hits air," she said. Shock waves, like sound waves, travel quickly in water and solids but not air. The wave slows as it hits the lung, Lance said, and "that energy has to transmit somewhere." "It was ... noted that men could be killed or disabled at considerable distance" from an explosive, Dr. Thomas Chiffelle, a pathologist from Albuquerque, New Mexico, wrote in a 1966 report for the US Department of Defense. "The man or animal may be killed outright, without external signs of injury, but often with blood-tinged froth or frank blood appearing in the nose and mouth." It is possible to survive a blast wave from far enough, according to Chiffelle's accounts. Witness accounts from the night of the Hunley's sinking claimed that there was a blue light coming from the ocean. Some speculated that it was the Hunley crew signaling that they'd accomplished their mission. It is virtually impossible to know how powerful the Hunley's torpedo blast was, even with the amount of black powder used. The blast can also change with how tightly the powder is packed and how fine the grains are, according to the Naval History and Heritage Command. Replicating the black powder explosion, Lance said, was the trickiest part of the experiment. "Any explosive we've seen in the field ... would definitely create a lethal wave," Lance said. "These types of injuries are not subtle," she added. "The damage is immediate." There was another piece of evidence that stood in her favor: a gold pocket watch that belonged to the Hunley's captain, Lt. George Dixon. The watch had stopped at 8:23, about the time of the Hunley's attack, historians believe. "Most importantly, it appears it didn't wind down naturally," according to a 2007 update by a research partnership known as the Hunley Project. "Something traumatic -- perhaps water, a shock wave, or some other intervening force -- caused it to stop at that precise time." Friends of the Hunley -- part of the Hunley Project, which was not involved in the new research -- declined to comment on the research. The organization maintains and researches the original submarine. Prior naval research has concluded that "neither phase of the explosion was severe enough ... to have significantly impacted Hunley." "We had a lot of submariners survive being depth-charged at very close quarters during WWII," said Paul Taylor, a spokesman at Naval History and Heritage Command. "You sort of wonder how they did OK, but supposedly the folks in the Hunley didn't." The Navy researchers who have been examining the Hunley for over a decade declined to comment on Lance's study while their own research on the crew deaths is ongoing. "This project was originally intended to be a side project, and then it spiraled out of control when we realized we could do actually do it," she said.